Jacob Reckless returns once again to the Mirrorworld--filled with profound characters, extraordinary creatures, and epic life-or-death treasure hunts that could only come from the mind of the master storyteller of our generation, Cornelia Funke. Jacob Reckless has only a few months left to live. He's tried everything to shake the Fairy curse that traded his life for his brother's--legends such as the All-Healing Apple, the Well of Eternal Youth, the blood of a northern Djinn. And yet hope after hope is extinguished. After months of fruitless searching, Jacob journeys through his father's mirror one final time to deliver the bad news to Fox. But there they hear of one last possibility--an item so legendary that not even Mirrorworlders believe it exists: a crossbow that can kill thousands, or heal one, when shot through the heart. But a Goyl treasure hunter is also searching for the prized crossbow. Jacob must find it first--and somehow convince Fox to do whatever it takes to save him. Looking through online reviews, most are in German. I think we need another English one out there, because this book is worth reading! I loved this novel a lot more than the first one, although I am still trying to pin-point exactly why. Maybe this is partially because Jacob Reckless’ Mirror World is so detailed that it took me the whole first book, Reckless, to get used to some new creature popping up every page or so. This time around I could enjoy it a lot more because everything wasn’t so new. Mainly, though, I think the storyline is woven with excellence and it is driven by finding a cure for the incurable- and if Jacob can find a cure, then he and Fox don’t have to leave one another. In the last book Jacob was trying to save his brother from a life of being a stone-man (Goyl) and bloody bodyguard. This was noble; his sacrifice in Reckless is what is eating him away today, in Fearless. And I mean literally eating him away. Jacob is left with a time-bomb over his heart, a moth which will eat it away one letter of a fairy’s name one bite at a time. This story builds so much on the last, and the consequences of not winning are so dire- it is driven by Jacob’s and Fox’s fear of death. Just in case the plot isn’t worthy in itself, the storyline is awesome. To save Jacob, they are on a spectacular and gruesome treasure hunt, devised by a mad evil warlock, hundreds of years previously. And there are others after the same treasure. And, to complicate it more, Fox gets stolen away herself by a completely unrelated purser. You see why I like it? Treasure-hunting appears to be a very dangerous sport, so, considering the characters are always on the move, looking for something, somewhere, we get a lot of action in Fearless. 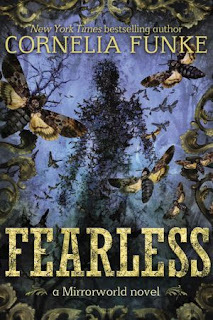 Jacob Reckless just might be falling-in-love in Fearless, which in and of itself is something to fear. Of course, my opinion is that he is already in-love, he is just figuring it out now as best-friends do sometimes. The problem is that they are barely with each other long enough to really have the time to consider what is going on or talk about it. Which, for the romantic, is maddening. But, like a good love story, there is hope, sacrifice, and those brief moments of touch which you wish (or more likely, they wish) time could be paused to hold. Of course I loved Jacob Reckless. I don’t know if I would have liked him as much without Reckless previously helping me be inclined to him. I think in the first book I just considered him arrogant, taking for granted what matters, and well, reckless. But seeing his sacrifices in the last book made me respect him a lot more. And he does have some major treasure-hunting skills, which can’t be overlooked as pure awesome. By this book, at least half a year has past since saving his brother and he has already been fighting his clock of death for awhile. By now he has stopped taking life and others for granted, which I find a great quality in a person. Then, add to that the way he starts to change his thinking towards Fox- I now consider myself smitten with him. Although Valient (the dwarf) and his mentor, Chanute, from the first book weave their way into this story, most of the other characters are short lived in Fearless. That is, except for Fox, Jacob’s sidekick, friend, and maybe something more. She is a Vixen, who can switch from a human form to a fox. In Fearless, we get to visit her home, where we get a little more backstory on the girl who clinged to Jacob when he first found her as a child. Up until now, I’ve liked her in the way that you like your best friend’s spouse. You see how good they are for the other person, although you personally don’t have a major bond to them. But this book might have made me just start bonding to Fox, too. Fox gets a few chapters to herself, but not as many as Jacob’s adversary, a treasure-hunting Goyl whom Jacob is racing for the crossbow. I actually really liked hearing his side of things, such as how frustrating this job is for him with his tag-a-longs, what his aspirations are, and hear about his begrudging respect for Jacob. It made me love him in a “Oh, I almost wish you could win too!” way. But not all the way. Ironically, in their war to win they actually probably end up helping each other out. It is a unique dynamic, but I will let you find out for yourself who wins, or at least, what it looks like. I hate this question, because I always am tempted to tell you every juicy detail that would ruin the story! So, I’ll try to be vague. Obviously, I loved the world behind the mirror; it is so spectacular. I love Reckless and Fox’s relationship, even with its annoying lack of definition. I love that they had to travel so far and wide to find the missing pieces (mines, ships, libraries, haunted cities). I love that the the author, Cornella Funke, threw in a haunting French folktale which really tested Jacob’s love for Fox. I liked a lot! The only thing I hated was that the love-story didn’t get nicely wrapped up with a kiss and a bow like I was expecting. In other words, I’m going to have to read the next book, because there is a cliffhanger to this one! Oh yes, I totally recommend it! I thought it was much better than the last one, first of all. Then, if you love fantasy, fairy tales, or books six and seven of Harry Potter, I would be so surprised if you didn’t love Fearless. Also, consider this a clean read, but I felt like it was complicated and advanced. I feel like most middle-grade aged kids would be confused even though the cover says it is for ages 12 and up. There is no sexual content and no language. But there was a moderate amount of violence. As something else to be wary of before you let your kids read this, there are a few notable dark and creepy parts in the story too, with some serious evil warlock magic that Jacob is having to fight against. I NEED to read Reckless so I can read this one too! I've heard great things about this series. I enjoyed Reckless, but it sounds like Fearless is even better. I'm glad Fox develops more and Goyl sounds like a really interesting character.